The weekend is coming! If you are having friends stop-by your place, and don’t have much time to prepare a big meal, or if are in the mood of having drinks and appetizers, then this is a really good choice. It is a fairly quick recipe and this time, Cauliflower takes the stage. Blanch the cauliflower florets. Mince the garlic, onion and parsley. In a bowl, lightly whisk the egg yolks, stir in the garlic, onion and salt, set aside. In a separate bowl, mix in the bread crumbs, flour, sugar, salt and pepper. If you would like to give them an extra “kick”, you could add a 1/4 tsp ground cayenne pepper. Dip the cauliflower florets in the egg yolk mixture and coat evenly. Transfer them into the bread crumb mixture bowl and toss until coated thoroughly. Heat a pan and drizzle with olive oil. Cook the cauliflower florets until golden brown. Drain on paper towels. Serve warm. Source: adapted from Group Recipes. 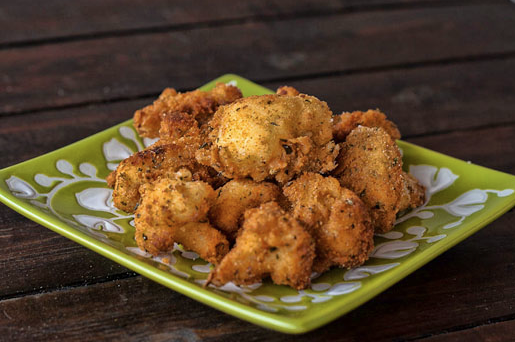 Categories: Cauliflower, Recipes | Tags: appetizer | Permalink.